As everyone returns for the start of another academic year we thought we’d take some time to look at the Universities of the United Kingdom. These were the founded between 1096 and 1600. A number of colleges were granted Royal Charter during the 1960’s and these are loosely referred to as “plate glass universities”. The Further and Higher Education Act 1992 allowed thirty-five polytechnics to become universities. There are now 161 universites throughout the UK, with over 2.5 million students. Universities in the UK are highly regarded throughout the rest of the world, and almost 450,000 foreign students study at our universities. Even those who never attended university can’t help but feel proud of the tradition and the standards set by our universities – long may they continue to stand as a symbol of quality education. Cranfield University is a British postgraduate and research-based university with two campuses. The main campus is at Cranfield, Bedfordshire and the second is the Defence Academy of the United Kingdom at Shrivenham, Oxfordshire. The main campus is unique in the United Kingdom for having an operational airport (Cranfield Airport) next to the main campus. The airport facilities are used by Cranfield University’s own aircraft in the course of aerospace teaching and research. The College of Aeronautics opened in 1946 on the former Royal Air Force base of RAF Cranfield[, and in 1969 became the Cranfield Institute of Technology which in turn becam Cranfield University in 1993. 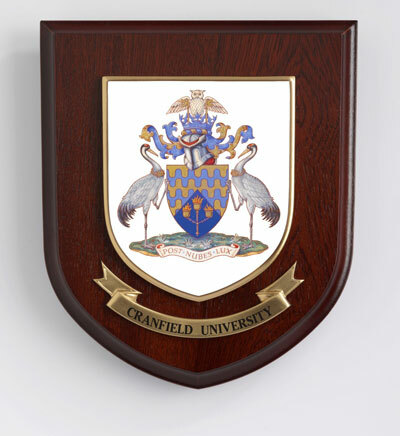 The Coat of Arms of Cranfield University combines two cranes, alluding to the University’s name, derived from “Cranuc-feld” meaning a field frequented by Cranes. The three-branched torch in the base refers to learning and knowledge in the sciences of Engineering, Technology and Management, while the Astral Crown in the cres signifies the College of Aeronautics. The Keys signify the gaining of knowledge by study and instruction, and the outstretched wings of the Owl represent knowledge in the widest sense. The motto, ‘post nubes lux’, means ‘out of darkness, light’. 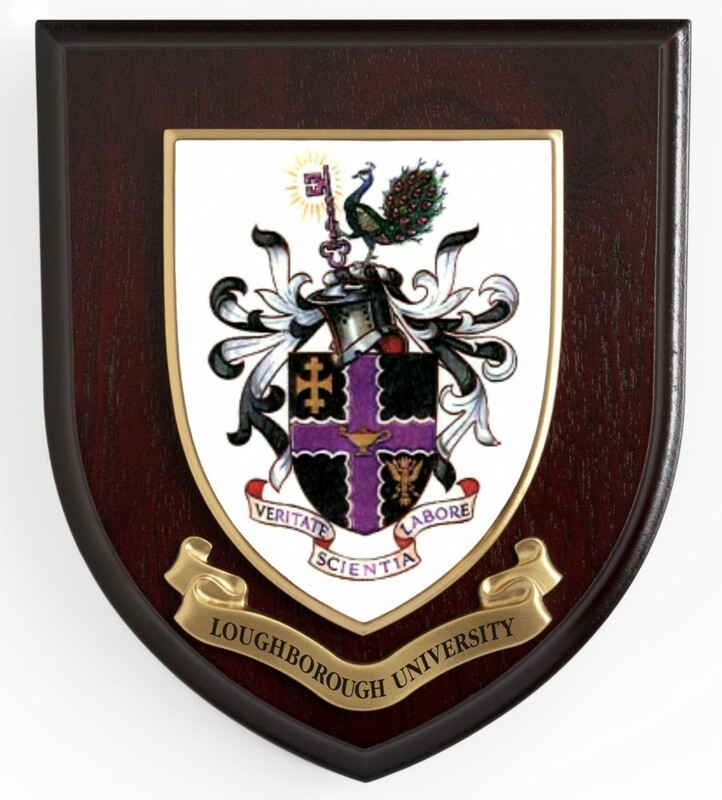 Loughborough University was granted a Royal Charter on 19 April 1966. The coat of arms granted by the College of Arms includes the official colour of the university, which is a shade of violet specifically called African Violet. 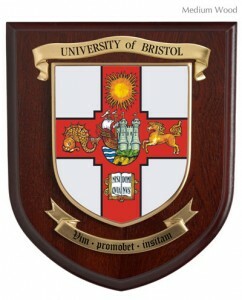 The coat of arms was designed to include certain symbols with a relevance to the area and the university. These include the cross of Offa of Mercia as a symbol of the greatest king of the ancient kingdom of Mercia (within whose borders Loughborough stands). Offa was responsible for the first major issues of gold coins in Britain. Another noteable addition to the coat of arms is the peafowl take from the original coat of arms of the Duke of Rutland. The motto on the coat of arms is veritate scientia labore, which translates to either “with truth, wisdom and labour”, or possibly, “with truth, knowledge and work. Either way it is an impressive and powerful coat of arms, although post London 2012 Olympics we wonder if it shouldn’t include those 5 rings. A coat of arms that is a source of pride to all of those that have a right to lay claim to it, and we are very proud of the reproduction on our plaques.